The table below sets out the charges for our mediation services. PLEASE NOTE: All quoted fees are per party on the basis of two parties; a further 10% will be applied for each additional party. All fees quoted are net of VAT. The mediation fee is payable in full 3 working days prior to the mediation. If the fees are not paid prior to the commencement of the mediation, the mediation will only proceed if the lawyers for all parties give professional undertakings that the fees will be paid within 28 days after the date invoiced. The above fees include the preparation time shown, any pre-mediation telephone discussions and correspondence, any follow up work should the parties not settle on the day of the mediation, and all administration. The fee remains payable if the parties settle before the expiration of the booked time for the mediation. 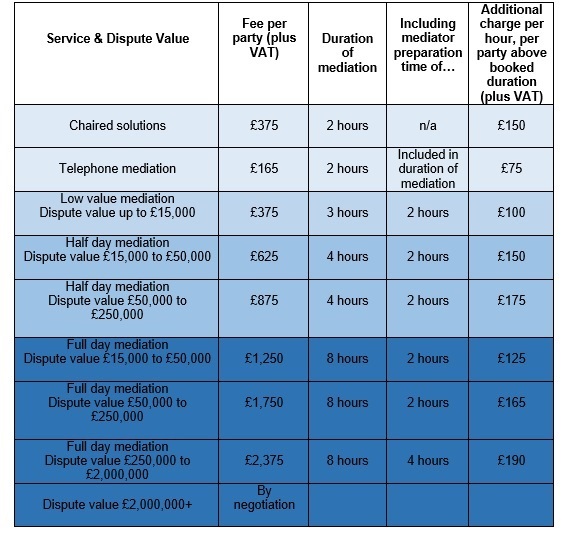 Additional preparation and mediation time (above booked hours shown above) for all mediations is chargeable as shown in table, per hour, per party. The balance of any supplementary fees shall be payable within 28 days after the date invoiced, and by signing the Agreement, the lawyers for all the parties undertake to ensure that such supplementary fees are paid within that outstanding balance will be paid within 28 days after the date invoiced. Mediator travel expenses are capped at £150.00. Mediator travel time to venues outside the North West may be charged at £75.00 per hour, per party, subject to agreement. Mediator overnight expenses are capped at £125, and shall only be payable where the mediation proceeds beyond 7 pm and/or goes into a 2nd consecutive day. Costs of venue/accommodation and refreshments are to be provided by the parties. Unless cancellation takes places more than 7 working day prior to the mediation, a fee of 50% of the agreed fee, not exceeding £500.00, shall be payable. Should the mediation be cancelled in advance of 7 working days prior to the mediation date, no fee is due.